Chili is Dairy Queen’s dressing — make that crown — for its latest iteration of the GrillBurger. The Chili Meltdown tops a -half-pound cheeseburger with spicy, meaty sauce, showcasing the product’s versatility and enduring appeal. Launched in September with the help of TV spots and newspaper inserts, as well as in-store promotions, DQ’s chili burger immediately shot up the popularity charts, where it occupied a spot next to other chain fixtures, including DQ’s cheeseburger and bacon cheeseburger. Sales have since settled down, but Schmiesing says the Meltdown remains a popular item. Schmiesing says. Turns out DQ didn’t have to look too far for inspiration. The chain has used chili to top off hot dogs for nearly 50 years, so ladling a little of it over burgers was “a natural,” Schmiesing says. 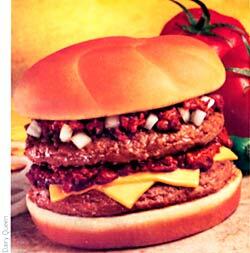 DQ also serves chili soup-style, but the burger topping is more viscous, lest it compromise the integrity of the bun.